walter pichler [via la periferia domestica], isolates the individual into a world where only media comes in. lygia clark, in contrast, was interested in self-awareness and the organic. her abyss masks blindfold the participant and have bags of air weighed with stones. 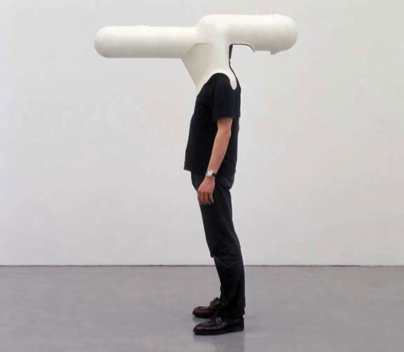 while clark privileges the senses, pichler isolates the participant in a world of media. so, what is up with 1968 and the obsession with self enclosure and weird sci-fi masks? [the lygia clark link leads you to another 1968 example by stelarc, who is more into prosthetics and interfaces between body and machines]. clark was influenced by the work of french phenomenologist maurice merleau-ponty, widely read in the early 1960s—particularly after he was published in english in 1962—. however, external events might have had a bigger influence. in 1964, the brazilian military staged a coup and took over the government, starting a period of repressive military dictatorship. in 1968, the dictatorship instituted the institutional act 5 (ai-5), further reducing individual freedom and increasing the power of the military. that year, clark left brazil to present her work at the venice biennial and then moved to paris. clark’s most introspective projects, the nostalgia of the body series, were made between 1964 and 1968.
in contrast, pichler [born and educated in vienna] focused his research away from the self and into a world of media and technology. his speculative drawings remind me of the work of john hejduk, particularly in their premeditated narratives. his explorations into sci-fi seem very relevant in today’s world of ipods and ipads [there’s a smile for you in that link btw]. but the similarities to hedjuk make me skeptical to his project as a warning. after all, isn’t pichler enjoying his isolation a bit too much? [in the mid-1970s pichler retreated from public life and lives in isolation, only returning to the city to exhibit and sell]. we might say that clark found refuge from repression in introspection, until she finally decided to flee [in 1968, she writes of her domestication and sounds guilty about her lack of political activism]. perhaps an example of phenomenology’s inability to cope with outside forces. but was pichler really escaping from media, or finding refuge in it? there is a dual fascination and warning in his images, and i cannot help but think that he’s actually enjoying the seduction of media and the isolation it gives him.